Your hard work is paying off. You are doing well in your field. But there is something standing between you and the next level of achievement. That something may just be one of your own annoying habits. Perhaps one small flaw �C a behavior you barely even recognize �C is the only thing that’s keeping you from where you want to be. It may be that the very characteristic that you believe got you where you are �C like the drive to win at all costs �C is the one that is holding you back. Marshall Goldsmith is an expert at helping global leaders overcome their sometimes unconscious annoying habits and attain a higher level of success. Named one of the five most-respected executive coaches by Forbes and a top-ten executive educator by the Wall Street Journal, Goldsmith has worked with some of the most influential leaders in Fortune 500 companies. His one-on-one coaching comes with a six-figure price tag. But in this book, you get all Marshall’s great advice without the hefty fee! The Harvard Business Review asked Goldsmith, “What is the most common problem faced by the executives that you coach?” Inside, he answers this question by discussing not only the key beliefs of successful leaders, but also the behaviors that hold them back. He addresses the fundamental problems that often come with success �C and offers ways to attack these problems. Say, for example, you have an extremely loyal and talented staff. You are known for spotting and nurturing talent. Your inner circle of employees regularly gets assigned the plum projects. You may think you are building a solid team, but from the outside looking in, you are encouraging sucking up. You are guilty of Habit #14: Playing favorites. Goldsmith outlines twenty such habits commonly found in the corporate environment and provides a systematic approach to helping you achieve a positive change in behavior. 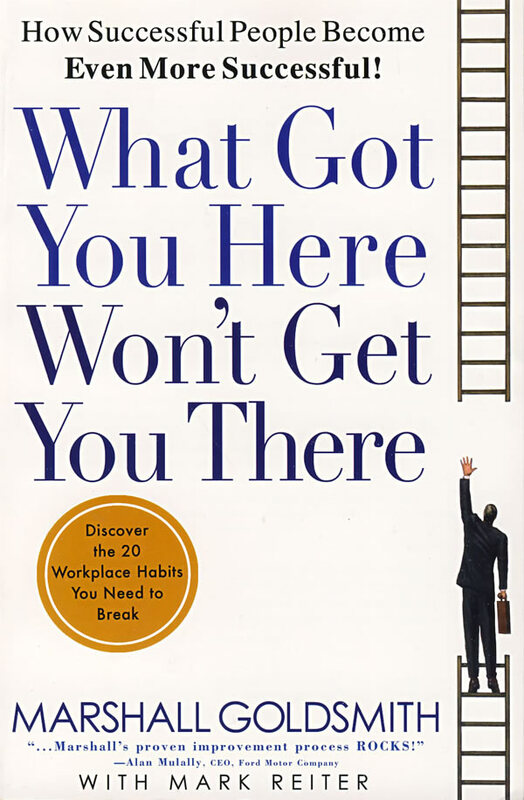 Whether you are near the top of the ladder or still have a way to climb, this book serves as an essential guide to help you eliminate your dysfunctions and more to where you want to go. Marshall Goldsmith is corporate America’s preeminent executive coach. Goldsmith is one of a select few consultants who have been asked to work with more than eighty CEOs in the world’s top corporations. He has helped implement leadership development processes that have impacted more than one million people. He holds a Ph.D. from UCLA and is on the faculty of the executive education programs at Dartmouth College’s Tuck School of Business. The American Management Association recently named Marshall one of fifty great thinkers and business leaders who have impacted the field of management, and Business Week listed him as one of the influential practitioners in the history of leadership development. In 2006, Alliant International University renamed their schools of business and organizational psychology the Marshall Goldsmith School of Management.